Long ago, in a galaxy far far away – or, more precisely, in March 2015 on p. 5 of a then newly-published book entitled Medieval Monsters, written by medieval historian Damien Kempf and art historian Maria L. Gilbert – an extraordinary illustration appeared that swiftly attracted considerable media attention, spawning all manner of newspaper and online articles during mid-April. 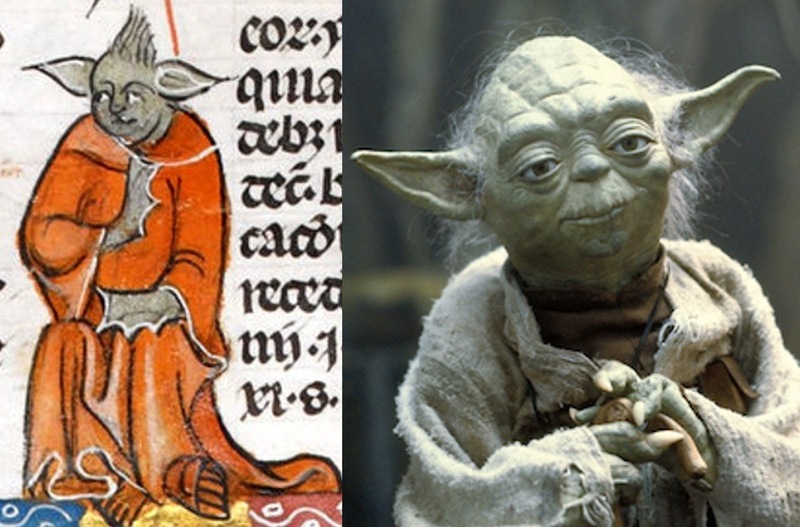 The illustration in question was a figure from an illuminated manuscript dating from the 14th Century – a figure reproduced at the beginning of this ShukerNature blog article and which, as noted by those numerous media articles, just so happened to bear a striking resemblance to none other than Yoda, the venerable Jedi Grand Master from the Star Wars movie franchise! Yoda first appeared as a (relatively) sprightly 900-year-old in The Empire Strikes Back – produced by Lucasfilm Ltd, released in 1980 and constituting the second film in the ongoing Star Wars series. In contrast, his Middle Ages doppelgänger appeared over 600 years earlier, in the Smithfield Decretals (a colloquial name deriving from its earliest known provenance, the Augustinian priory of St Bartholomew's at Smithfield, its official title being the Decretals of Gregory IX with glossa ordinaria [i.e. commentary] of Bernard of Parma). This is a parchment codex in Latin, which dates from c.1300-1340, and can be found in the British Library listed as Royal MS 10 E IV (with the mystery figure appearing on f. 30v). Written in southern France (probably Toulouse), the original manuscript arrived in London during the early 1300s where numerous marginal illustrations were added. It was presented to the British Museum in 1757 by King George II as part of the Old Royal Library. The likeness of the strange entity in this early historical manuscript to Yoda was not actually commented upon in Medieval Monsters, but was highlighted by British Library curator Julian Harrison in his blog Medieval Manuscripts on 17 December 2015 (in a guest post on this same blog for 14 April 2015, the authors of Medieval Monsters had briefly alluded to it in a whimsical poem about their book's contents). Looking at this enigmatic figure, there is unquestionably a similarity, from its monk-like attire, and long ears sticking out at right angles from its head, to its spiky hands, greenish skin, and facial expression. Consequently, once the various media articles aired online, it was not long before fevered speculation arose as to whether Yoda was indeed based upon the enigmatic image from the Smithfield Decretals. However, the designer of Yoda's distinctive appearance, the late Stuart Freeborn (d. 2013), a British motion picture make-up artist, always stated that the character's face was based upon his own, and that his eyes were inspired by those of Einstein in order to give them a wise but kindly look. Moreover, it seems highly unlikely to say the least that back in the pre-internet years of the 1970s when he was creating Yoda's character, Freeborn was even aware of this exceedingly obscure centuries-old French manuscript, let alone had access to a copy of it. So if not a prototype for Yoda, what exactly was that medieval manuscript-featured monk with the big ears meant to represent? 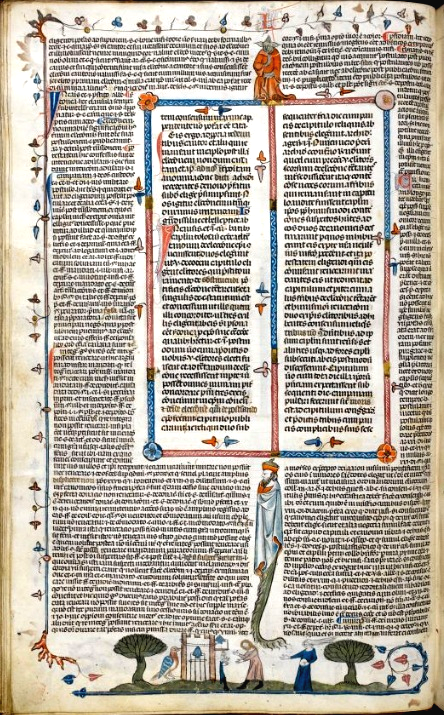 Some articles erroneously claimed that this orange-robed figure appeared in a retelling of the biblical story of Samson present within the Smithfield Decretals, but in reality the latter manuscript is a collection of canon law composed during the 13th Century that served as an addition to the Decree of Gratian, the main collection of canon law composed during the 12th Century. (Decretals are actually collections of papal letters that compile decrees on church law.) Consequently, as postulated on the Auckland Theology & Religious Studies blog, the Yoda impersonator was quite possibly intended to represent the devil attired as a demonic doctor of canon law, signifying that some clerics charged to uphold the law were actually corrupt and exploitative of their flock. 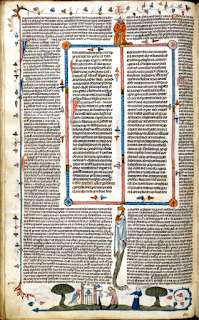 The only link, conversely, to Samson is a series of illustrations concerning his life that run along the bottom edge of certain folios of the Smithfield Decretals (including the folio containing the Yoda image in the main text), but which have no connection whatsoever with the subject of the main text. However, it is conceivable that this controversial figure may have no religious significance at all, but was merely inserted as a joke by one of the manuscript's illuminators. 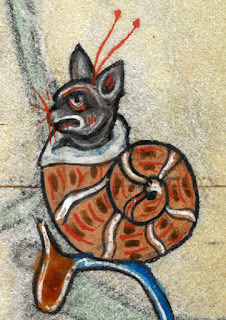 The creation of non-existent entities by illuminators as sly subversive humour or merely to relieve the tedium of the lengthy task at hand when copying or illustrating such manuscripts is well known, and has even resulted in the recurrent appearance of certain well-defined but entirely fictitious creatures, such as the snail-cat, for instance, as documented by me in a previous ShukerNature article (click here). 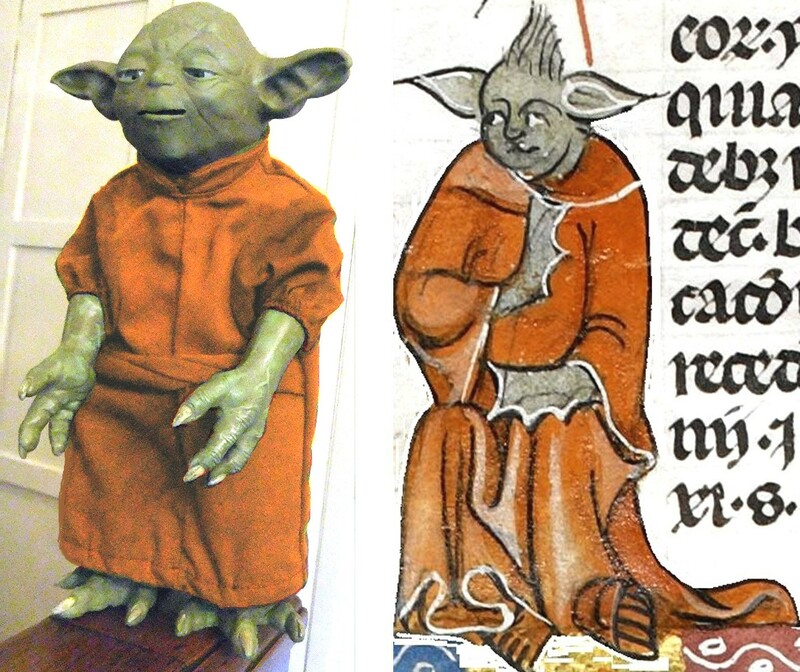 Consequently, 'Yoda of the Smithfield Decretals' may well be nothing more than a medieval doodle, whose similarity to the Star Wars character is actually only a superficial one, but which has been blown out of all proportion by the shared monk attire. 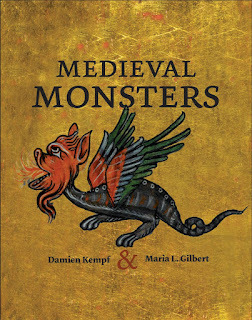 During the 9 months since Medieval Monsters was published, all manner of other explanations for the ostensible correspondence between the two figures have been aired online, ranging from the sober to the surreal. 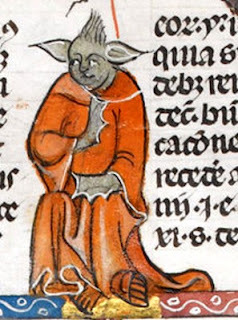 However, my personal favourite is one alleging that perhaps a time traveller viewed a Star Wars film featuring Yoda, then went back in time to the creation of the Smithfield Decretals and somehow succeeded in surreptitiously including a depiction of Yoda within its text. As the late, great British broadcaster Robert Robinson was wont to say when faced with 'imaginative' answers to questions: "Ah, would that it were, would that it were". I live in Pueblo, Colorado. I moved out here when I was six and since then I've heard stories of the prairie devil, the pig man and the mini-rex; there's even old Indian legends of evil river demons. You get older and you try not to believe in monsters, however not even the high school kids will have a kegger [outdoor keg beer-drinking teenage parties] down by the river without a raging fire and a lot of people [presumably to ensure that 'monsters' keep well away]. It's not like people don't see things, people see them they just don't make a big deal of it. If you live by the river like me you just get used to it. It was three to four feet long, greenish with black markings on its back, and a yellowish-orange under belly. It walked on its hind legs, never dragging its tail, its front limbs (I call them limbs because they were more like arms than anything) were smaller in comparison to the back ones and it had four or three claws/fingers. I'm not sure for it was seen at a great distance. It also had some kind of lump or horn over each eye. When it noticed our presence it let out a high pitched screech or some sort of bird chirping, that pierced my ears, and then took off. Derick and his friend returned at once to Derick's house to fetch a camera, then returned to the location of their encounter and photographed the creature's three-toed, 2-in-diameter tracks (with a Marlboro Red cigarette placed alongside them in some photos for scale purposes). Derick also stated that he subsequently heard of other sightings, and discovered that a friend had actually photographed one such creature. Following some persuasion, the latter friend allowed Derick to send scans of those photos, together with his own track photos and July 1998 sighting account, to Ron, who in turn showed them to fellow American cryptozoologist Chad Arment, who has a particular interest in American mystery reptiles. However, as the photos showed little detail, even when magnified, Ron and Chad agreed that their subjects could easily be dinosaur models. Referring to the creature in this photo as a 'river lizard' (but which is presumably the same type as the mini-rex that he saw), Derick stated that it had taken him some time to obtain scans of it, and that he didn't know when or specifically where it had been snapped, only "somewhere" in Colorado. As this creature does not resemble any species currently recognised by science, Chad later attempted to email Derick for further details, but received an automated reply that Derick's email address was no longer in operation, and has never heard from him again. However, Chad has learnt from another source that the term 'river dinosaur' has apparently been used in relation to such creatures, and even that an individual who had previously collected Colorado reptiles for some of Chad's friends working in the pet trade had also offered to capture for them some 'river dinosaurs' (whose description compared closely to the appearance of the 'river lizard' in the above photo supplied by Derick). Unfortunately, Chad's friends had been forced to decline this exciting offer due to lack of funds. The 'river lizard' photograph supplied by Derick has been floating around online for many years now, and has attracted much attention and numerous comments on the many websites where it has appeared, with the consensus seeming to be that it is a hoax, although this has never been confirmed. (I have conducted several Google-image searches, concentrating variously upon the whole image, the section featuring the person, the section featuring the creature, etc, but all to no avail.) However, it certainly contains some anomalous features, especially in relation to the creature's appearance, as commented upon by Chad in an account of this and other bipedal 'dinosaur' sightings reported from the U.S.A. (North American Biofortean Review, vol. 2, #2, 2000). 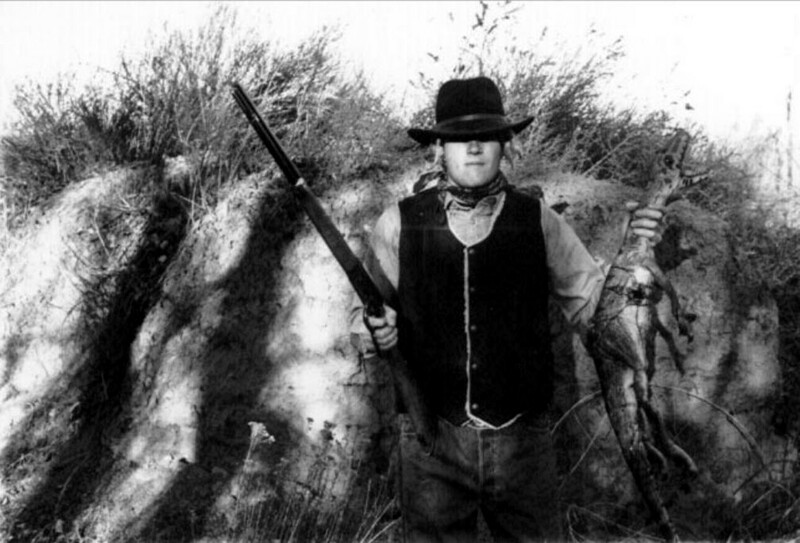 For example: if the 'river lizard' had only recently been shot when this photograph was snapped, and bearing in mind that recently-dead reptiles are normally very limp, and also bearing in mind that it was being held vertically, why is its tail curving inward rather than simply hanging straight down? And why is its mouth gaping open rather than being held closed, or at least nearly so, as one would expect under the above-listed conditions? 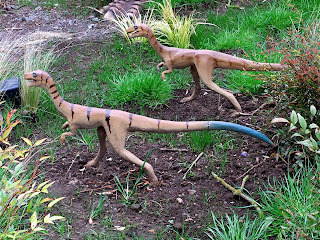 As Chad also pointed out, very convincing life-like rubber models of dinosaurs can be readily obtained nowadays, so we cannot be sure that the 'river lizard' in the photo was ever a living entity anyway. And even if it was once alive, thanks to the photo-manipulation software that was already available back in 2000 there is no certainty that this creature's appearance hasn't been profoundly modified digitally from whatever it was originally. Moreover, the entire photograph might conceivably be a cleverly-constructed melange, i.e. an original photo of a person holding a gun into which a second, digitally-manipulated photo of some animal has been deftly incorporated. Certainly, whenever I've looked at it, I've been struck by just how very odd, how very unnatural its image seems to be, and I don't just mean the bizarre appearance of the 'river lizard' itself but the whole image. Even the person's face is so obscured by the shadow of their hat that I'm not exactly certain whether they are male or female. But returning to the 'river lizard': having spent a lifetime observing animals in photos and in the living state, at the risk of being accused of sounding unscientific and overly reliant upon gut instinct it just doesn't look 'right' to me. Thus I consider it plausible that this 'river lizard' photo is indeed a hoax, my line of thought being that its mystifying creature constitutes some form of manufactured composite (either physical or photo-manipulated), perhaps a much-modified dead monitor lizard, sub-adult crocodile, or even dinosaur model, for instance. Moreover, if my reasoning so far is correct, then I further suggest that the creature's bizarre-looking hind limbs as seen in the photo are fake, that they have been seemingly less than skilfully attached to (or superimposed upon) its body, and that they presumably replaced whatever hind limbs it may have originally possessed, this substitution having been done to enhance even further the contrived exotic, unfamiliar appearance of this creature for this photo. Having said all of that, however, this is nothing more than speculation on my part, and I am well aware that I could be entirely wrong, with the 'river lizard' potentially being a bona fide cryptid carcase after all (if so, I would be only too happy to be wrong!). So I'd be most interested to receive any comments, views, or additional information concerning it from other investigators and readers. Speaking of which: one American cryptozoologist who has investigated this and other such cryptids with particular zeal, and success, since 2001 is Nick Sucik, who duly published his very thought-provoking findings in a chapter devoted to this subject in a most interesting compendium edited by Chad Arment and entitled Cryptozoology and the Investigation of Lesser-Known Mystery Animals (2006). As will soon be discovered when reading Nick's chapter, a fair number of roughly consistent cases have been documented from a range of U.S. localities over the years, but with particular frequency across Colorado. The size of such beasts may differ, as may eyewitness recollections of colouration, but by and large the same image of a miniature bipedal dinosaurian creature with sturdy hind legs, much smaller, delicate forelegs, a long study tail, small but very sharp teeth, and bare skin crops up time and again, with eyewitnesses comparing what they have seen to certain fossil theropods (at least in basic outline), including T. rex and Compsognathus (the latter small theropod being very comparable size to most of the mini-rex specimens reported). Its body appeared smooth, devoid of fur or feathers. Its height perhaps was three feet and the small head was bent downward on a slender neck. The creature ran on two skinny legs with its tiny forelimbs held out in front of its body as it ran. Its body tapered down into a lengthy tail that, combined with the head and neck, made it about 5 feet long. The movement of the animal was noted as graceful, the head not bouncing as it ran. The animal quickly passed in front of them and disappeared into the darkness. Its eyewitnesses were shocked by what they had seen, but after they had regained their composure one of them joked that it must have escaped from some local Jurassic Park. 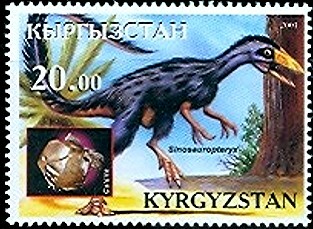 Although a light-hearted remark, it is nonetheless telling, as it serves well in underlining just how very dinosaurian the creature must have appeared to them – as opposed to rather more mundane alternatives, such as an exotic escapee from captivity (like a wallaby, but which is furry and jumps, not runs; or a rhea or emu, which do run, but are feathered). Certain lizards as known to adopt a bipedal running gait on occasion. Perhaps the most famous of these is the Australian frilled lizard Chlamydosaurus kingii, up to 2.75 ft long and which has often been likened to a raptor when sprinting bipedally. 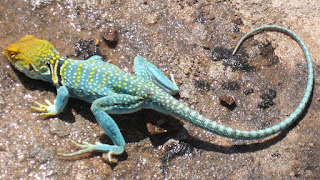 So have North America's collared lizards (genus Crotaphytus), which measure around 1 ft long. 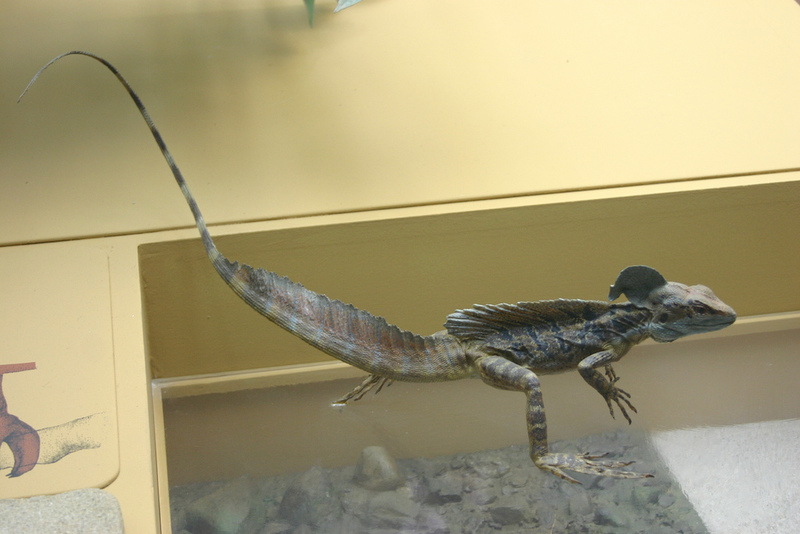 In South America, the basilisks (genus Basiliscus), up to 2.5 ft long, can do the same too, even sprinting bipedally across stretches of water, and these are also commonly kept as pets in the U.S.A., so specimens may escape into the wild here on occasion. Indeed, the description of one bright green, crested, 2-ft-long, lengthy-tailed bipedal "baby dinosaur" allegedly caught then released by an 11-year-old boy in 1981 alongside some railway tracks in New Kensington, Pennsylvania, sounds just like one of these lizards, which by then were becoming quite popular as exotic pets in the States. However, there are some notably behavioural and morphological differences between such lizards as these and the more typical, much more mysterious mini-rex. For instance, none of these lizards are habitually bipedal, whereas the mini-rex apparently is. Moreover, their forelimbs are held laterally when they run bipedally, whereas those of the mini-rex are held in front of its body when it runs bipedally. Also, these lizards are smaller than all but the smallest mini-rexes on record, whereas some of the bigger examples of the latter cryptid are at least the height of an adult human. True, certain of the large monitor lizards are popular pets that often escape, can grow several feet long, and can run bipedally, but only for very short periods, not in the habitual and very rapid manner described by eyewitnesses for all mini-rexes, even the biggest ones. One 'not-so-mini' mini-rex was reported by a lady called Myrtle Snow, who seems blessed with an extraordinary ability to encounter these mystery reptiles, judging at least from the fact that she claims to have done so on several occasions throughout her life in and around Pagosa Springs, Colorado, as documented by Nick. Perhaps the most dramatic incident described by her allegedly took place during or around the late 1930s when, following the loss of several lambs to an unknown predator, a Pagosa Springs rancher armed a shepherd and asked him to guard the remaining flock. This he did, very successfully – by shooting dead a large, mysterious creature deemed to be the predator, whose carcase was then placed on a sled and hauled back to the ranch by one of its Apache ranch hands, using a team of mules. ...about 7 feet tall, gray in color, had a head like a snake, short front legs with claws that resembled chicken feet, large stout back legs and a long tail. Curiously, when interviewed more recently by Nick, Snow also claimed that its body had been covered in fine grey hairs. If so, then parsimoniously this tends towards a mammalian rather than a reptilian identity for the creature, though I am aware that certain fossil pterosaurs were hairy (but these 'hairs' were quite different structurally from true mammalian hairs and are called pycnofibers) and that the plumes of certain feathered fossil dinosaurs, e.g. Sinosauropteryx, were filamentous and therefore quite hair-like. Snow stated that the only observer who was apparently familiar with this extraordinary creature was the Apache ranch hand, who claimed that it was what elders on his reservation referred to as a moon cow, and which they said had been seen periodically in the past but were nowadays rare. Worth noting here is that although the name 'moon cow' seems strange, it just so happens that a very similar name, 'moon calf', is a rural term used widely across Europe for an aborted, teratological foetus of a cow (and sometimes that of other farm animals too), deriving from the once-popular folk belief that these malformed creatures resulted from a sinister effect of the moon. It has also been used more generally to refer to anything monstrous or grotesque in form. Could this distinctive term have reached North America with the original Western settlers and subsequently become incorporated into Amerindian parlance too, or might the notion of lunar influence upon the occurrence of malformed creatures have simply arisen independently on both sides of the Atlantic? In view of the creature's alleged hairiness, I cannot help but wonder whether this was its true identity, i.e. a malformed mammal of some kind. Ironically, there may have been a chance of finding out for sure, because according to Snow the creature's carcase was packed in ice and sent by train to the Denver Museum for examination and identification. When this claim was pursued on Nick's behalf by an archivist at the museum, however, no record of any such specimen ever even being received there could be found. Conversely, what had definitely been sent to this museum and formally examined there, as Nick discovered, was a box containing two alleged 'baby dinosaur' skeletons, one having been found inside a mineshaft and the other in a cave near to it, in Cortez, Colorado. Such creatures were apparently familiar to the local Navajo people, and during the early 1960s one of the skeletons was displayed at Cortez Museum. It was following the museum's eventual closure that the box was sent to Denver Museum, but when the skeletons were examined there they were found to be composites, constructed from the bones of various different species of mammal – in other words, they were hoaxes. It was described as having sharp little hooks on its hands and very sharp teeth, like that of a kitten. Its skin was like a lizard's but felt warm. It never tried to bite or scratch but it did not like being held. The animal behaved "like a tame squirrel." During the time they kept their pet, it grew from the size of a kitten to roughly the size of a cat, by which time it was far too big for the cage. Eventually their family had to move elsewhere in order to follow the crops, so their father told them to leave their pet behind. Of especial interest here is that when the aunts first told their nephew about their most unusual former pet, back in the 1970s, they remembered that when it ran it "flattened out, stretched its head out front, tail out back and was really fast". 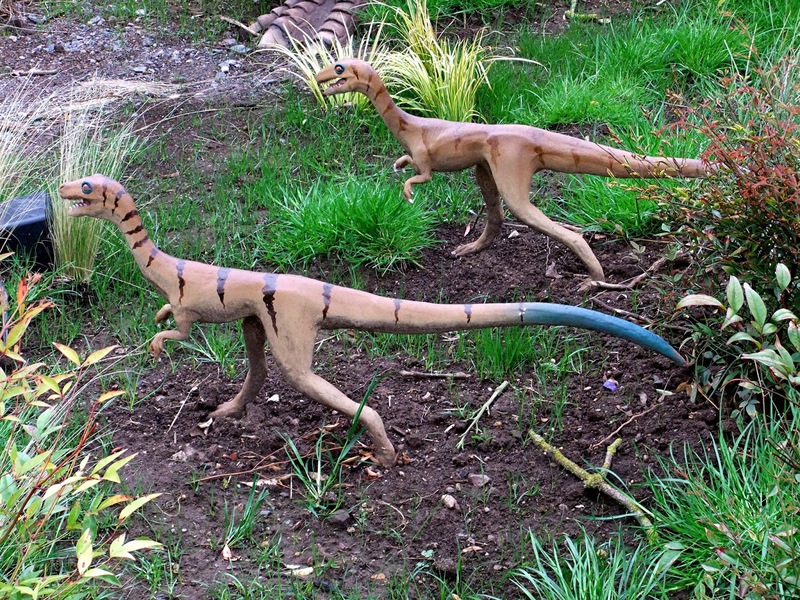 As pointed out by Nick, whereas this running posture is widely accepted nowadays by palaeontologists for bipedal fossil dinosaurs, it wasn't back in the 1970s. So if the aunts had been making up their story, they were remarkably prescient concerning this particular facet of dinosaur behaviour. Just a coincidence? The other case of reputed mini-rex capture came to light when a lady wrote to Nick to inform him that her three boys had once caught such a creature in New Mexico. The specimen in question was unusually large but slow-moving, and when they caught it they could see that it was old, with fainter body colouration than other, faster specimens that they had previously seen (but had never succeeded in capturing). Its body alone measured 20-24 in, i.e. not including its lengthy tail, but after admiring this impressive creature for a while, the boys released it. Interestingly, they referred to it as a mountain boomer, a colloquial name normally applied to collared lizards. What could the mini-rex be? As with so many cryptids, it may well be a non-existent composite, i.e. it has been 'created' by the erroneous amalgamation of reports featuring various totally different species. The smaller individuals may indeed be nothing more than lizards sprinting bipedally, yet species like the collared lizards are so common and familiar that it seems difficult to believe that people living in locations where they occur would not recognise them for what they were. Perhaps, however, some mini-rex reports involve less familiar lizard species that are currently not known by scientists to be capable of bipedal locomotion. Yet the posture and habitual bipedalism reported for these cryptids do not accord well with lizards anyway, regardless of species. So is it possible that somewhere in the more rural regions of Colorado and elsewhere in the United States there really are bona fide 21st-Century bipedal dinosaurs (albeit of quite modest dimensions), sprinting along in blissful ignorance of their official demise 66 million years ago? It seems highly unlikely. Yet there is surely little doubt that something that corresponds at least ostensibly with such an identity is indeed out there. ...such tales, whether they be true or not, add to the folklore of what our world would be like if dinosaurs lurked in secret and only stepped out into the clearing momentarily to be seen. If there were or are such things, they perhaps would possess the safety of being too unbelievable. An excellent point – for there can be no doubt that it is this precise quality of unbelievability which serves so many cryptids so effectively in keeping them out of the clutches of scientific recognition. After all, who is going to admit to having seen creatures that sound too unlikely to be real, and who is going to seek them even if their eyewitnesses do admit to having seen them? Thank Heavens, therefore, for the Nick Suciks of this world, who choose dispassion over disbelief. May their zeal be rewarded one day with the discovery of those cryptids that they seek. Four species of modern-day hyaena are presently recognised by science – the spotted hyaena Crocuta crocuta, the striped hyaena Hyaena hyaena, the brown hyaena Hyaena brunnea, and the aardwolf Proteles cristatus – all four of which possess a respectable (and sometimes notably shaggy) pelage. This is why a very unexpected discovery of mine has left me decidedly perplexed. Serendipity has played a significant part in several of my cryptozoological finds, and this one is no exception. While perusing the internet in search of some 19th-Century engravings depicting a totally different type of animal, I happened upon the truly remarkable engraving opening this present ShukerNature blog article. As can be seen, the animal in question is labelled in it as a "naked hyaena of the desert Africa", and apart from sporting a dorsal mane, a tail tuft, some cheek fur, and some short hair running under its chin and along its throat, it does indeed appear to be naked. 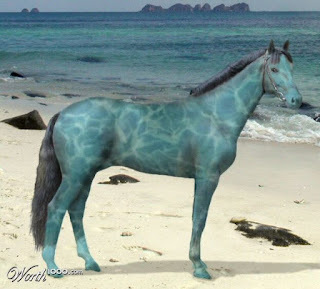 Yet as far as I am aware, no animal matching its bizarre appearance is known today. This race is small and gaunt, entirely destitute of hair, excepting the mane on the ridge of the neck and back. The bare skin is of a purplish black, the body is short, and the tip of the tail is furnished with a small brush. I would have expected an animal as visually arresting as this to be extensively documented. Yet despite a diligent search online and through every relevant publication in my not-inconsiderable personal zoological library, I have so far been unable to uncover any additional information concerning it, not even the briefest of mentions. It is as if it never existed. So how can Nubia's anomalous naked desert hyaena be explained, and what has happened to it? 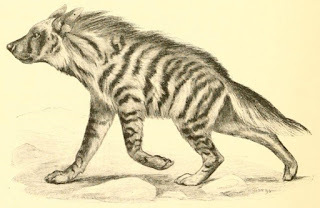 As Jardine classed it as a form of the striped hyaena, the naked desert hyaena presumably belonged to the latter species' Nubian subspecies, Hyaena hyaena dubbah, which does inhabit desert fringes (though not the interiors of true deserts) and sub-desert terrain. However, this subspecies possesses a normal, uniformly fully-furred pelage, not just a dorsal mane, tail tuft, and a few very restricted areas of hair elsewhere. Could it be, therefore, that the naked desert hyaena was based upon some freak, near-hairless individuals, yielding a local non-taxonomic variety? Or (as a less plausible but more zoologically-intriguing alternative option) did it constitute a discrete race, distinct from the typical Nubian striped hyaena, which may have bred true? If the latter were correct, then the naked desert hyaena would surely have represented a valid subspecies in its own right. Yet as I am not aware of any evidence suggesting that this extraordinary form still survives today, the prospect of the naked desert hyaena being a non-taxonomic freak variety of the Nubian striped hyaena seems the more rational of these two options, with its limited number of specimens simply dying out without perpetuating their strain. 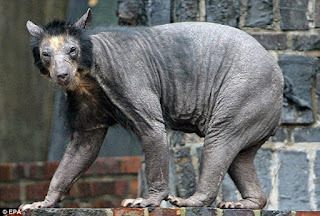 After all, bare skin is hardly an advantageous feature for a surface-dwelling desert mammal's successful existence beneath an unrelenting blazing sun, and is unlikely, therefore, to be actively selected for via evolution's 'survival of the fittest' modus operandi. The cause of a freak hairless variety's nakedness would surely be the expression of some form of mutant gene allele. Such a situation is responsible for hairlessness in a number of other mammalian species, though different mutant alleles cause hairlessness in different species (i.e. this condition is not caused by one and the same allele across the entire spectrum of species known to exhibit freak hairlessness). Having considered genetic options, there are also some externally-induced possibilities to consider. Foremost of these is that in reality, Nubia's naked desert hyaena consisted of individuals suffering from some form of skin ailment, such as mange (caused by tiny parasitic mites), whose debilitating effects may also explain their small body size and gaunt appearance. In other words, these creatures' growth may have been stunted, due to their ill health reducing their ability to find food. Having said that, on first sight the distribution of hair on the animal depicted in Smith's engraved artwork seems far too regular to be explained in this way. Mange-infected animals often have irregular, inconsistently-distributed patches of hairlessness. In the most severe cases of mange, however, sometimes the only fur remaining on an infected animal is a prominent line of hair running down its neck and along its back, a ruff around its neck extending from behind its ears and over its cheeks down to its chin and throat, and sometimes a tuft at the end of its tail. 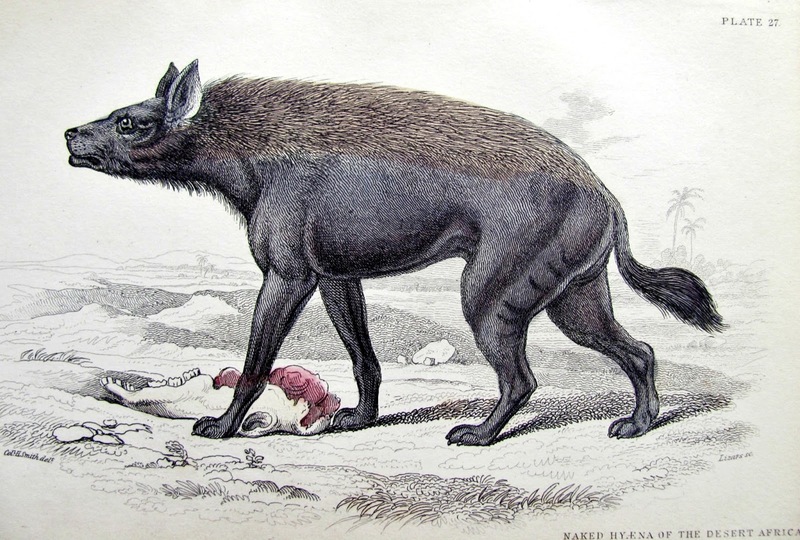 This description perfectly corresponds with the distribution of hair described by Jardine for Nubia's naked desert hyaena and depicted in Smith's representation of it. Consequently, I consider it most likely that this latter mystery beast, long banished from the annals of natural history, was merely based upon one or more specimens of mange-ridden, under-nourished hyaena that had been out-competed by bigger, fitter, healthier hyaenas in the less environmentally-adverse areas at the fringes of Nubia's desert, and had thus been forced to seek sanctuary amid this desert's more arid, less hospitable interior instead. Support for this theory comes from an ostensibly unexpected cryptozoological source – the chupacabra. Or, to be more precise, from the so-called hairless blue dogs of Texas that have been frequently if erroneously identified as blood-sucking chupacabras (especially in media reports). The most famous example is the specimen that rancher Phylis Canion found dead just in front of her ranch outside the small Texas town of Cuero on 14 July 2007. DNA samples were taken, which identified it as a coyote, albeit one that apparently possessed at least a smidgen of Mexican wolf ancestry too, thereby suggesting that a degree of hybridisation had occurred between these two species at some stage in this creature's family tree. Media reports regularly state that its blue-grey skin was completely hairless when it was discovered. However, as he disclosed when investigating this intriguing animal, chupacabra researcher Ben Radford noted that photographs taken of it by Canion on the day that she found it outside her home clearly showed a conspicuous line of hair running from behind its ears down its neck and along the centre of its back. This is of course a classic indication of the presence of mange, and other 'hairless blue dogs' on record have presented a similar appearance. Also very pertinent to this subject is the so-called 'Isle of Wight Monster' that had been scaring people there since early autumn 1939, and was said by eyewitnesses to possess the head of a lion. When it was finally snared and shot on 16 February 1940, however, the IOW Monster proved to be nothing more exotic than an old fox with very advanced mange that had left a ruff of hair around its neck, resembling a lion's mane, but very little fur elsewhere on its body. Providing a useful contrast, in January 2010 a completely hairless raccoon was found dead on the Runaway golf course in Wise County, Texas, where it had quite likely frozen to death in the wintry weather. Originally, it was assumed to have been suffering from mange, but when examined by biologists it was shown not to have been after all. 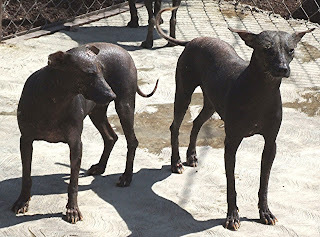 Hence its highly unusual condition was most probably congenital (as is also true with the xolo, Mexico's famous hairless dog breed), emphasising well that mange does not generally reduce an individual to a state of total hairlessness. Another interesting specimen of relevance here is the horse with soft velvet-like skin of a lilac-blue shade and totally lacking not only hair but also hair follicles that was discovered in South Africa by a merchant called Lashmar during 1860 (and which I've documented here on ShukerNature). He spied it among a herd of quagga Equus quagga quagga (the semi-striped subspecies of plains zebra that became extinct in 1883), successfully captured it, and brought it back to England in 1863, where it was exhibited in London's Crystal Palace during February 1868. What has never been determined, however, is whether this remarkable animal was truly a domestic horse – for if so, where had it come from? Alternatively, and much more logically, might it have been a freak hairless quagga, thereby explaining why it was associating with quaggas? Irrespective of its precise taxonomic identity, it was the first of many hairless equine individuals to be publicly displayed down through the years. Others of prominence include Caoutchouc - a black, entirely hairless feral horse (even lacking eyelashes) with skin resembling India-rubber that had been captured in Australia and was displayed widely around the world during the 1870s; and two individuals from the 1890s. One of these was Wild Nell, dubbed the 'India-rubber skinned mare'. The other was Bluebell, the $25,000 'hairless wonder'. As with the totally hairless raccoon from Texas and the Mexican hairless dog, these horses' complete absence of hair was due to the expression of a mutant gene allele, not to any external skin complaint. A fourth explanation for freak hairlessness is influence by non-pathological external factors, such as climate and diet – and this is the explanation favoured by experts for the gradual but ultimately near-total loss of hair suffered by three female Andean spectacled bears housed at Germany's Leipzig Zoo and previously fully-furred. Their plight and grotesque appearance hit media headlines worldwide during late 2009, but it transpired that a similar phenomenon had struck a number of other, unrelated spectacled bears in captivity elsewhere around the world too - thereby eliminating a common source of infection or a shared genetic fault from consideration. In short, hairlessness in mammals can be caused by a number of different factors, but judging from its specific appearance I still favour mange or some comparable skin infection as the most reasonable explanation for the naked desert hyaena of Nubia. To my knowledge, this is the first case of hairlessness in hyaenas that has ever been brought to cryptozoological attention, and does not even appear to have featured in any mainstream zoological works since Jardine's tome. Indeed, it is this very state of being conspicuous only by its absence that lends further support to the likelihood that this hyaena is – or was - a short-lived, unrepeated, pathologically-induced curiosity rather than a genetically-engendered, non-taxonomic curiosity or local variety, or a distinct taxonomic race. For if any of the latter possibilities were correct, I am certain that something not only as morphologically memorable as a near-hairless hyaena but also of such potential genetic and evolutionary significance would have attracted ongoing scientific interest, leading to this beast's continued documentation in the zoological literature. Instead, like so many other wildlife oddities, Nubia's naked desert hyaena was only of brief, passing interest, and no doubt vanished from existence soon afterwards anyway, thereafter to be forgotten for generations until I happened by chance to uncover what seems to be the only illustration ever prepared of this fascinating creature, and realised that here was a forgotten treasure from the dark vaults of unnatural history that richly deserved to be retrieved and redisplayed. It was ever thus.